It’s been such a crazy SpringOne Platform 2018 and we literally just started! I don’t even know where to begin! The show represents the convergence of the best and the brightest in the ecosystem. It’s absolutely amazing all the people who want and love to be here. …and my friend Ray Tsang from Google and Bruno Borges from Microsoft..
It’s nice when you can reunit with old colleagues who are now ecosystem partners and friends - it was amazing to see former VMWare and Pivotal alum Mark Chmarny (left) representing Google’s KNative efforts today! This isn’t quite what I think most of us involved in the @s1p keynote were expecting when they said there was a ‘green room’! 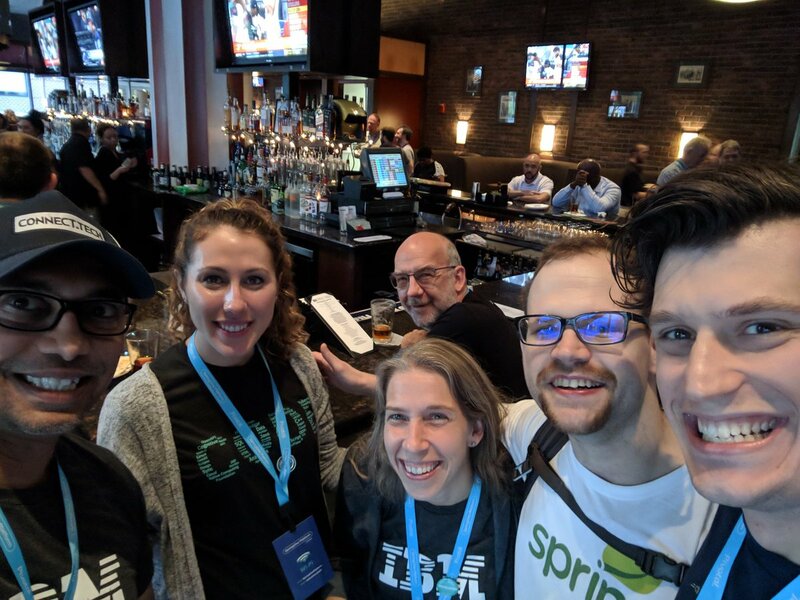 It was also great to see former SpringSource colleagues and friends Rod Johnson (creator of Spring) and Christian Dupuis representing Atomist, the new continuous delivery sensation that’s sweeping the nation! I had fun MC’ing this morning’s keynote with Pivotal legend Dormain Drewitz! 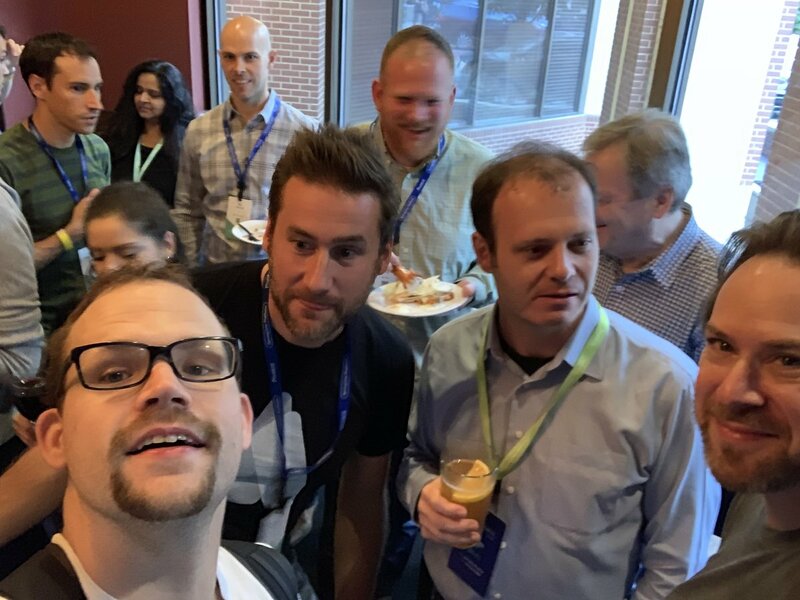 It was crazy fun sharing the stage with some of the best in the business, including the Spring team’s own legends, Spring co-founder Juergen Hoeller and the good Dr. David Syer. I am so grateful that my buddy Matt Raible and I managed to finish a crazy 75+ printed pages of blog content just in time for the big show! Cheers buddy! We did it! It wouldn’t be a world-class event if, in addition to seeing old friends, we couldn’t make new ones. Neha Narkhede, co-founder and CTO Confluentinc, and co-creator of Apache Kafka, absolutely killed it this morning in her keynote address at the conference. What a legend! What an amazing speaker and an amazing technologist! I had the privilege of introducing DICKS Sporting Goods so I thought I’d dress the part. I even went to a store in south San Francisco this weekend and got my attire just for their big debut! For every photo or moment I’ve shared here are a thousand other ones I haven’t shared. It’s been an INSANE 24h since the show started in full swing and we’ve got miles to go before we sleep! So, without further ado, let’s get to this week’s amazing, release-packed roundup! Good news everybody! Spring Tool Suite 4 is here! I want to personally congratulation Spring Tool Suite lead Martin Lippert on this incredible journey! STS 4 is a complete reworking of the engine behind the plugins supporting our Eclipse distribution. That engine represents a radical reprioritization of goals: the tools give you validation now based on runtime behavior instead of false positive yielded by trying to second-guess Spring at design time. The result is that using Java is fast and productive during development - no red squigglies with which to contend! - and any validation and navigation information is informed by the actual runtime behavior of the application. It’s just more accurate. Additionally, the engine itself has been extracted out into language servers which run independent of Eclipse and are supported in Microsoft Visual Studio Code and Atom. I’m super impressed with this release! This has been a long and well-worth it journey. Spring Boot team legend Madhura Bhave has just announced Spring Boot 2.1.M4! The new Spring Boot 2.1.0.M4 release ships with a ton of things including preliminary support for Spring Data JDBC, including a @DataJdbcTest annotation. Check it out! Spring Boot for Apache Geode & Pivotal GemFire 1.0.0.M3 Released! Meet the New AWS Service Broker for PCF, Now an Open Beta. Here’s Why It’s the Easiest Way to Add 18 AWS Services to Your Cloud Native Apps. I love that buildpacks have been finally extracted out into a separate thing that’s now standard across platforms. Read on to learn more! Just in time for SpringOne Platform, check out riff v0.1.3. Riff is the function-as-a-service sensation that’s sweeping the nation! My buddy Matt Raible and I have been burning the midnight oil to get this massive blog series - three parts spanning 70+ printed pages in all! - out in time for the epic SpringOne Platform event. It is so worth a read. The SpringUni blog have a nice post on using Spring Cloud GCP with Google Cloud that expands upon a post in my recent 8-part miniseries. It’s worth a read! In light of the new Java 11 release, it feels appropriate to look at the long and fascinating history of Java thus far.